The fragrance is expressive with notes of fruits, malt, chocolate and coffee, in the background delicate smoke. Strong and complex on the palate. Delicate fruit with distinct coffee notes and caramel, with malt, some smoke and dried fruit. A long finish and an absolutely ravishing reverberation make the whisky-luck perfect. 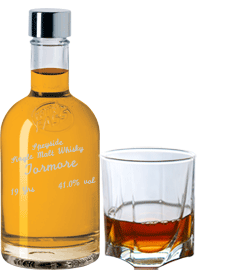 The Toremore distillery was designed in 1958 by the famous architect Sir Arthur Richardson and is a listed building. It is the first whisky distillery built in the 20th century. The water for production comes from the nearby Achvochkie spring.